If I can finish this post in 45 minutes or less, then technically it will still meet the deadline to legitimately be “Tuesday,” well at least here in Arizona. I went to Nashville, Tenn., this past weekend and just got back home this evening. And while there is nothing “green” about flying across the country, allow me to share part of the weekend festivities. My best bud and old college roommate, Will, met me in Nashville since I haven’t seen him since last September. 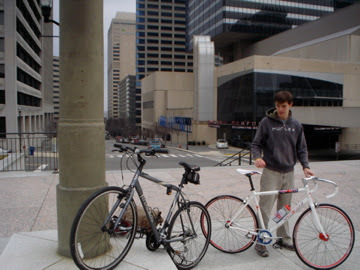 I wanted to show him around Nashville, particularly downtown, so we decided to cruise the streets on our bikes. 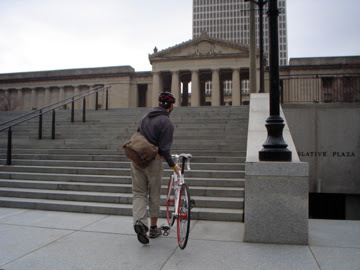 It was a great way to see the city at our own pace, enjoy the cold Tennessee air, and not have to set foot in a car. Downtown Nashville is not a particularly large area, but there are tons of venues for live music. Nashville is proclaimed to be the country music capitol of the World, after all. 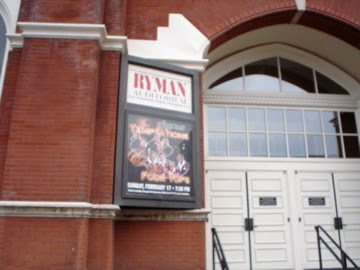 The city is steeped in music culture, especially country and bluegrass. 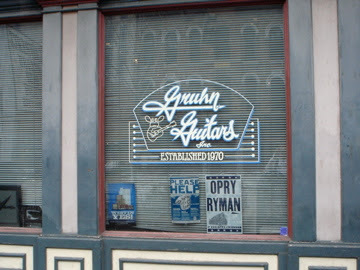 We stopped at the Gruhn guitar shop, which serves as THE go-to place for many of country music’s and Nashville’s finest musicians. The next time you are in need of a $15,000 Gibson banjo, check out Gruhn. 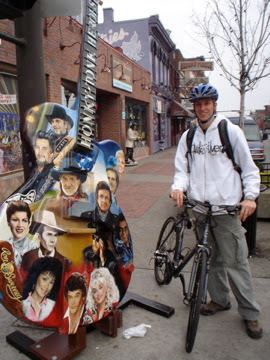 The city has lots of these guitars placed all over, but this is the only one we were able to find. We climbed the steps of the State Capitol building and got a pretty sweet view of the downtown area. I love bluegrass music, which is popular in Nashville, but have never been a big fan of country. However, the feel of a downtown environment that is rich with the community of music is a really cool thing – you can hang out downtown any day of the week and hear free music from some really talented people just playing on the street. 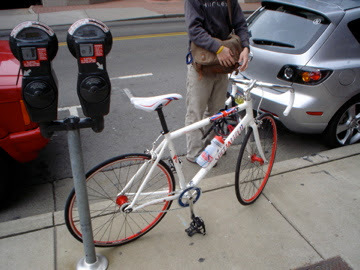 For the observant ones amongst you, you might notice that Will was riding a Specialized Langster London. These bikes have been quite rejected by the cycling community because of their big-brand capitalization of a more independent style. In my eyes, if it gets someone on a bike and out of their car, then that is green enough for me.